The African Q. Septimus Florens Tertullianus (ca. 150–222 CE), the great Christian writer, was born a soldier's son at Carthage, educated in Greek and Roman literature, philosophy, and medicine, studied law and became a pleader, remaining a clever and often tortuous arguer. At Rome he became a learned and militant Christian. After a visit to churches in Greece (and Asia Minor?) he returned to Carthage and in his writings there founded a Christian Latin language and literature, toiling to fuse enthusiasm with reason; to unite the demands of the Bible with the practice of the Church; and to continue to vindicate the Church's possession of the true doctrine in the face of unbelievers, Jews, Gnostics, and others. In some of his many works he defended Christianity, in others he attacked heretical people and beliefs; in others he dealt with morals. In this volume we present Apologeticus and De Spectaculis. 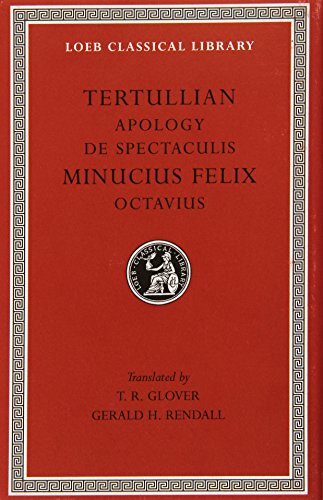 Of Minucius, an early Christian writer of unknown date, we have only Octavius, a vigorous and readable debate between an unbeliever and a Christian friend of Minucius, Octavius Ianuarius, a lawyer sitting on the seashore at Ostia. Minucius himself acts as presiding judge. Octavius wins the argument. The whole work presents a picture of social and religious conditions in Rome, apparently about the end of the second century.